The art of printing has been part of civilisation since mankind worked in co-operative groups. The Chinese communicated with imperial decrees and textiles printed from hand cut wooden blocks. In Asia the textile crafts produced complex multi coloured patterns on cotton and silk weave (paisley patterns). These were much prized in Europe and imported on mass until stiff tariffs were levied in the late 18th century to protect the emerging home textile industry. The art of producing wood cut illustrations and text blocks for printing was common in Europe, often the main client was the Catholic Church. 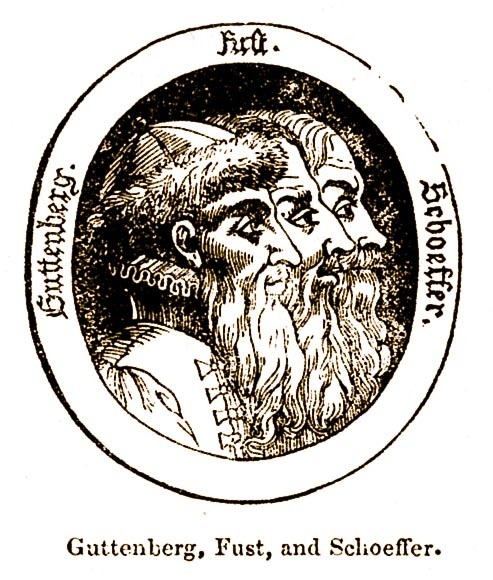 Johannes Gutenberg spent many years and the majority of his wealth on developing and perfecting his ideas of engraving texts and printing by pressure. 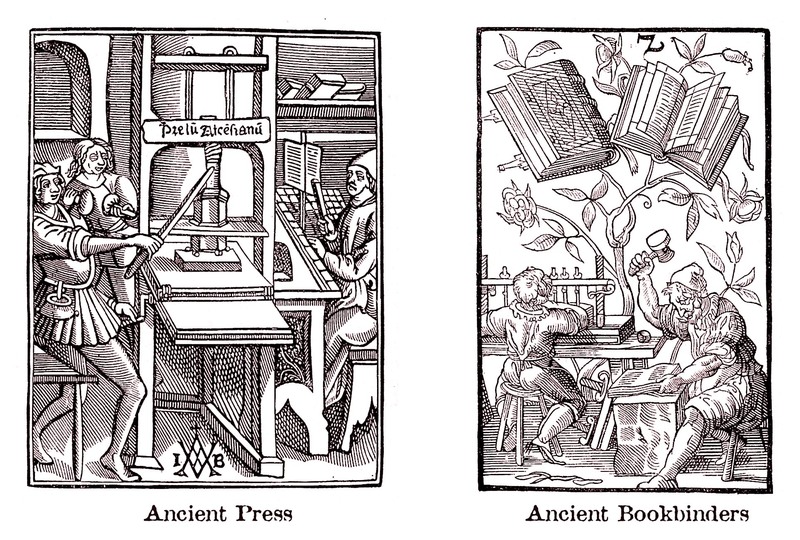 The earliest experiments were to engrave wood or metal blocks with the written word and print these in a press (possibly a converted wine press). 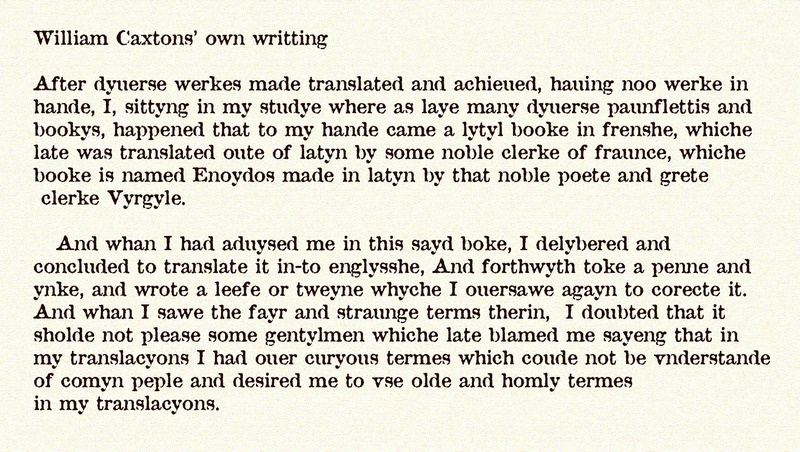 This eventually lead to the idea of engraving single founts (one letter) on an individual block. The whole project was almost abandoned through exhaustion of money and spirit until John Fust (Faust) also of Mentz joined the project. The first book printed by the “single engraving” method was the Bible with new found cost and difficulties. Even though the type was moveable and reusable it proved a labour intensive and costly task to produce enough engraved founts for the impressions. Peter Schoeffer (Peter Opilio Shoeffer) de Gernshiem of Mentz joined the project and at his own expense perceived the idea and experimented with engraving “matrix, incidenti” or moulds to cast type of the full alphabet, punctuation and numerals. After a full set of moulds was made and the correct alloy (tin 4%, antimony 11% and lead 85%) was found many founts could be cast in one days work. The three inventors of the new technology administered an oath of secrecy to all whom they entrusted “the art of using printing moulds” to keep this knowledge within “the Gutenberg printing office”. The politics of Europe was turbulent with the many small Kingdoms, Duchies and affiliates often in conflict. In 1462 the city of Mentz was sacked by the army of the Duke of Saxony, in the aftermath the printing office, type moulds, equipment and skilled workmen moved on and were dispersed to different districts and countries. Robert Large was Lord Mayor of London 1439-40 and a man of considerable substance, on his death in 1441 he bequeathed money to many good causes and to his servant William Caxton twenty marks. 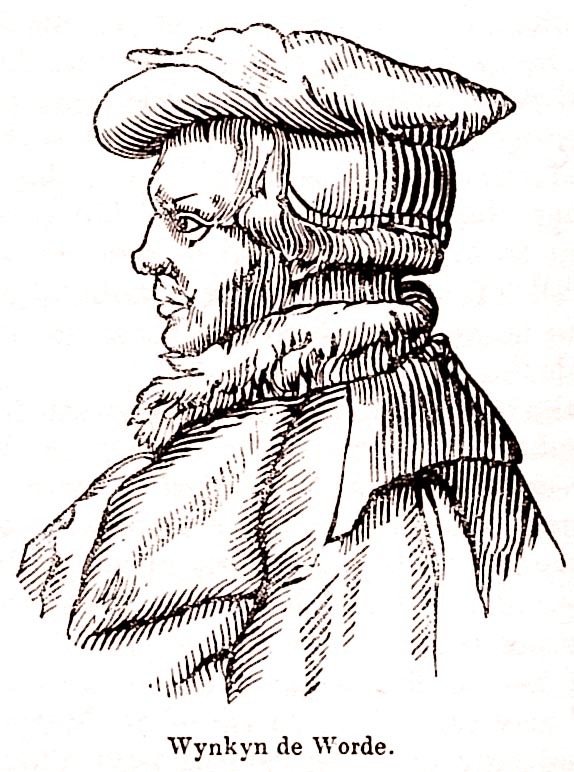 After this time William Caxton lived and worked abroad, possibly for the “Company of Mercers” in the business of merchandiser (travelling sales man). The areas he travelled in could have been Holland, Zealand, Flanders and Brabant (the low countries). His role was as a merchant, negotiator, and diplomat to bypass the mass of statutes, prohibitions and treaties that inhibited commerce by many trade routes between England and Medieval Europe. After many years of trade and translation work William Caxton was living in Bruge and employed by Margaret Duchess of Burgundy. His labours were to translate and prepare texts for printing, this work involved William translating through French, Latin and English. This completed work was printed in Europe, possibly Cologne which was not far from Mentz, at later times in Bruge and Ghent. He read and later translated “Recuceil of Troye” a Medieval Romance from the French and commisoned the printing in Engish, making this possibly the first book printed in the English language. This employment made William Caxton familiar with the preparation of the texts for printing and the actual equipment and processes needed to make the ink impression on a page. In England Thomas Bourchier Archbishop of Canterbury was petitioning King Henry to introduce the art of printing to his realm or as it was called to procure a “printing mould”. Plans were made in secret and money found to “draw off” workmen from Haarlem in Holland where Johannes Gutenberg had his printing office. Two people were appointed for this task, a Mr Turnour, who would be in disguise and Mr Caxton as himself, already being well known in the low countries. They were entrusted with one thousand marks and instructed to travel to Amsterdam and on to Layden. They did not dare go directly to Haarlem as many before with the same intent had been imprisoned. The pair sought to find amicable partners by giving “gifts” to those with the knowledge of printing, until the whole one thousand marks was spent, the King advanced a further five hundred marks. In the end two Hollanders made an agreement to find a workman with all the skills and knowledge of the art of printing. This man was Frederick Corells (Corsellis) he was taken at the dead of night in disguise and smuggled on board a ship bound for London. The planners thought London was too dangerous and Thomas Bourchier Archbishop of Canterbury, who had been vice-chancellor of Oxon (Oxford university) arranged for Frederick Corells to work “underground” in secure “Printing Office” at the university until all of his knowledge had been put to full use. Caxton first set up his printing moulds, composing bench and press in a side chapel called the Eleemosynary, Almonry or Ambry at West Minster London. His first major obstacle was the English language! The aristocracy spoke Court French and the Clergy, Schools and Universities used Classic Latin, Caxton did not want to use either, even though he was fluent in both. His aim was to produce commercially viable books to be understood by “the masses”. There were two obstacles, England was divided into distinct dialect groups West, South East, East, Middle England and Northern England with other distinct sub groups within these. Dialect does not refer to accent only but to the use of different words, phrases and sentence constructions. the phonetic representation of the word as it was heard in any one district. Also mis-translation from other languages e.g. : Eleemosynary, Almonry or Ambry. Another common practice had been for a scribe to “copy a book” and to produce one new copy in the dialect most preferred by the customer. ( So a book by one author would have many varied versions). The mass market for printed books was in the English language. After much research and work by William Caxton he formed a common structure of spelling, which was contained in the first English dictionary. The main subjects William Caxton printed were not religious but as a well experienced merchant he produced what he knew he could sell, also producing his own “advertising leaflets” for his publications. (1474 to 1475 William Caxton translated “The Game and Playe of Chesse” this being the first book printed in England. The list of his full works is numerous but a few titles would have included Chaucer, Gower, Lydgate and Malorys’ Morte Arthur and classics from Cicero and Æsops’ Fables. From 1477 William Caxton had Noble and Royal patronage in his translation and printing work, it is though he produced in the region of one hundred books. This patronage is not recorded, but was supposed as thanks for his endeavours in bringing “printing moulds” to England, William Caxton may well also have been granted a Royal pension of twenty pounds a year. The records of the time are sparse and “The Printing Office” was a secret place, the books produced often had mis-spellings and conflicting dates on the title pages leading to more confusion. 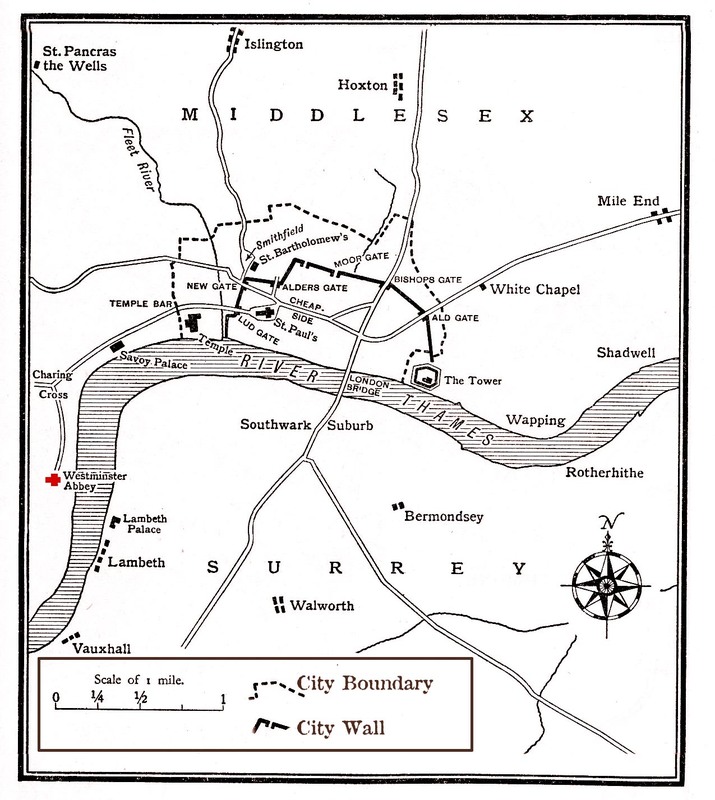 Also England was often not at peace, The Wars of the Roses 1455-1485 with armies engaging in battles at St Albans, Towcester, Barnet and Bosworth Field. These works hold listing of medieval printed books.